What the New CPP Agreement Means for You! The agreement reached in Vancouver to enhance the CPP last week was historic in nature. Still, some people will benefit far more than others. Many Ontario workers, for example, would have been better off with the provincial pension plan that was abandoned by the Ontario Government within days of the signing of the CPP accord. There is no question that Canada’s finance ministers reached an historic agreement in Vancouver on June 20. There is also no question that the changes in CPP design that the ministers agreed upon represent an eventual increase in CPP benefits for all workers when compared to the current CPP design. 2) Are Ontario workers – who comprise almost 40% of the Canadian labour force – better off under the new CPP regime than they would have been under the Ontario Retirement Pension Plan (ORPP) that was scheduled to be fully implemented in 2019 – the first year of a 7-year phase-in of the agreed upon CPP changes that won’t be completed until 2025? This is relevant given that with the signing of the CPP accord, the Ontario Government moved within days to kill its ORPP initiative. Before answering these two questions, it is important to provide some context to the discussions that took place in Vancouver on June 20th. The task for the finance ministers meeting in Vancouver was to see if there was a formula for reform that had a chance of getting 7 provinces containing two-thirds of Canada’s population (the amending formula for the CPP) to buy into. This was always going to be a challenge given that B.C., Saskatchewan and Quebec had been clear in the previous federal-provincial meeting in December, 2015 that they had little appetite for any sort of CPP/QPP enhancement and Manitoba’s brand new Conservative government was almost certain to join this “sceptic” group. 1) Would there be any increase in the CPP replacement rate (i.e. the proportion of your working life income you’d get from your CPP benefit within the prescribed income range you pay CPP premiums on)? 2) Would the income range covered by the CPP (the so-called Year’s Maximum Pensionable Earnings (or YMPE) be increased? 3) If the answer to one or both of the above questions was yes, what would the phase-in period be for the increased replacement rate and/or increased YMPE? 4) What could be done about the fact that for low income seniors receiving the Guaranteed Income Supplement (GIS), a good part of any modest increase in CPP benefits would be clawed back through a reduction in their GIS benefits? In approaching these questions, the Ministers rightly regarded the CPP as a highly flexible platform that was capable of delivering a second tier of pension benefits that might be structured quite differently than the existing first tier of benefits. In theory, this even opened up the possibility that a second tier of the CPP would be targeted and not universal – for example, applying only to those without a separate workplace-based defined benefit plan. After all, that “wrap-around” option was the approach taken by the Ontario Government’s ORPP and had the support of many pension experts. So how did the Ministers answer these questions in their Vancouver agreement? The first major change increased the annual payout target from about 25 per cent of pre-retirement earnings to 33 per cent. That means workers who earn $54,900 a year (the current CPP maximum) would receive a maximum annual pension of about $17,500 in 2016 dollars by the time they retire, an increase of $4,390 a year according to federal finance department estimates. CPP premiums would be increased roughly 1% to 5.95% each for employees and employers. The finance ministers also maintained the universal approach to benefits so the enhancement applies to those with defined-benefit plans as well as those without. The second change would increase the maximum amount of personal income covered by the CPP from $54,900 to about $82,700 when the enhancement is fully phased in by 2025. This means that under the new CPP regime, higher-income workers would be eligible to earn CPP benefits on a larger portion of their income. However, the advertised increase in the YMPE is not really as significant as it seems. In the fine print of a backgrounder posted on the Ministry of Finance website several days after the conclusion of the Vancouver meetings, officials estimated that by 2025 the indexed YMPE would have increased to $72,500 without the changes to the YMPE agreed upon in Vancouver. Therefore, the changes agreed upon in Vancouver really only amounted to increasing the YMPE from $72,500 to $82,700 by the time the increased YMPE was fully phased-in in 2025. In 2016 dollars, this amounts to a YMPE increase from $54,900 to to just shy of $63,000. But for the average Ontario worker, the meaningful comparison isn’t really with the difference in benefits between the old CPP regime and the new CPP regime but between the benefits provided under new CPP regime compared to the benefits that would have been provided under the provincial ORPP – an initiative that was quickly killed off by the Ontario Government with Ontario’s acceptance of the CPP enhancement terms negotiated in Vancouver. Before comparing benefit levels between the new CPP regime and the ORPP, it is worth noting that the ORPP would have been fully phased-in for almost all participants by January 1, 2019. Again, this compares to the schedule for the new CPP regime which won’t be fully phased-in until 2025. This brings us to a comparison of the actual benefits under the two plans. First, the replacement rate under the ORPP (when combined with the existing CPP) was 40% as opposed to 33.3% under the new CPP regime. This means that the increase in retirement benefits would have been 15% under the ORPP (on top of the 25% replacement rate of the existing CPP) compared to 8.3% (also on top of the existing CPP 25%) under the new CPP regime. In other words, the increase in benefits under the ORPP would have been almost double the increase in benefits under the new CPP regime negotiated in Vancouver. Secondly, the YMPE (again, the income range covered by pension benefits) under the ORPP would have been $90,000 as opposed to $82,700 under the new CPP regime. Therefore, higher income workers would have been receiving benefits under the higher replacement rate based on a somewhat larger contribution base under the ORPP. So Ontario workers without a workplace defined benefit plan (or a defined contribution plan not comparable to the ORPP) will get roughly half the increase in benefits that they would have received under the ORPP plan. The ORPP would also have been phased-in much more quickly than the CPP enhancements. The Conference Board of Canada, who was commissioned by the Ontario government to do an official cost-benefit analysis of the ORPP, put the number of Ontario workers eligible for the ORPP at 4.2 million workers out of a total Ontario workforce of just over 7.5 million – or 55% of Ontario’s labour force. What that means is that the decision by the Ontario government to accept the CPP enhancement terms negotiated in Vancouver and kill the ORPP, resulted in roughly 4.2 million Ontario workers getting half the increase they would have gotten if the government had gone ahead and implemented the ORPP. That said, there are benefits accruing to other Ontario workers from the CPP enhancement that would not have taken place under the ORPP. The most significant, of course, is that Ontario workers with workplace based defined-benefit plans (or “comparable” defined contribution plans with at least a combined employee/employer contribution rate of 8%), will receive the higher CPP benefits while they would have seen no benefit increase under the “wrap-around” design of the ORPP. Moreover, while the Wynne government had begun discussions with the federal government over including federally regulated workers and the self-employed in the ORPP, at the time the plan was killed, they were still excluded from the ORPP. In contrast, both groups will be included in the CPP increase (albeit the self-employed will pay both the employee and employer components of the increased contribution as they do now under the CPP). So while the 55% of Ontario workers with no workplace pension plan will receive roughly half the increase in retirement benefits that they would have received under the ORPP, close to 45% of the Ontario workforce (albeit overwhelmingly those with existing defined benefit pension plans) will receive an enhanced CPP benefit while they would have received no benefit from the ORPP. 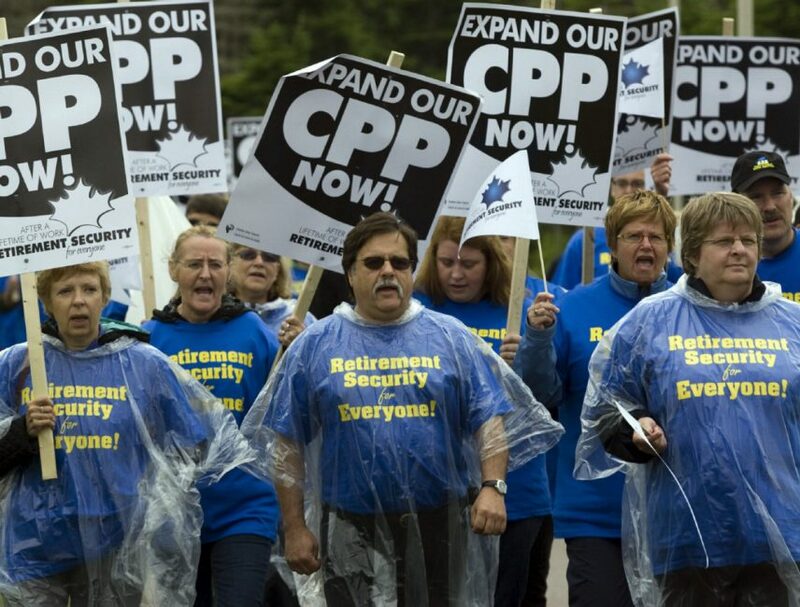 However, while it is true that that those with defined benefit pension plans will see an increase in their CPP benefits, it is far from certain that most defined benefit plan members will actually see an increase in their total retirement benefits as a result of the Vancouver CPP enhancement deal. That’s because while the CPP enhancements are certainly “universal”, in the past, CPP changes have resulted in offsetting reductions in many workplace defined-benefit plans that essentially negated the CPP increase of the time (the so-called CPP offset). Such “co-ordinating” or “integration” provisions (i.e. co-ordination and integration of the workplace pension plan with the CPP), currently exist in 95% of defined-benefit pension plans. But would these existing “clawback” provisions be automatically applied against the latest CPP enhancement? This depends on the exact language in the different defined-benefit plans. However employers, in particular, may believe that the 8-14% contribution rate each for both employers and employees (the typical contribution range for most public sector plans) plus the existing 4.95% CPP contribution rate for both employers and employees, is sufficient to provide an adequate pension benefit for plan members. They simply won’t see the need for an increase in their total contributions to pay for more generous retirement benefits. So even if the existing wording of some of these CPP “co-ordination” provisions won’t automatically “clawback” all of the CPP enhancement through reduced workplace pension benefits, many employers will likely push for new language in their defined-benefit pension plans that does. In summary, in response to the CPP enhancement negotiated in Vancouver, many existing workplace defined benefit pensions will reduce their benefits to “compensate” for the increased CPP benefit. And they will call this reduction “co-ordination” or “CPP integration”. That said, It is likely that not all existing workplace plans will be reduced and the workplace pension adjustments that are negotiated may not negate all of the new CPP enhancements. Finally, new language will take some time to negotiate – language that may (or may not), be resisted by the unions involved. There are two other changes worth noting in the CPP agreement negotiated in Vancouver. Firstly, employee CPP contributions currently receive a tax credit based on the lowest income tax rate. According to the Vancouver agreement, the enhanced portion of employee CPP contributions will be treated differently and be fully tax deductible. While a majority of workers will benefit marginally from this changed tax treatment of contributions, higher income individuals with earnings taxed at higher rates, are the real beneficiaries. Employer CPP contributions will remain fully deductible. More importantly, the Vancouver agreement acknowledges that for low-income workers, some of the enhanced CPP benefit will be clawed back through reduced Guaranteed Income Supplement (GIS) benefits. This was also a problem that plagued the ORPP design. Introduced in 1967, the GIS is a monthly income-tested retirement benefit intended for low-income seniors with little income other than Old Age Security benefits. Eligibility for GIS depends on income levels, but also marital status. There are two benefit rates for GIS, one for single pensioners and a lower rate for pensioners with spouses or common-law partners. For low-income seniors, increased income from other sources (including CPP) leads to offsetting reductions in GIS benefits through an income “clawback” of 50%. In other words, for every dollar gained in increased CPP benefits, GIS benefits are reduced for low income seniors by 50 cents. This was the stated reason Quebec refused to be a signatory to the Vancouver agreement. But the Vancouver agreement both acknowledges the problem and proposes a solution: an enhancement of the federal Working Income Tax Credit (WITC). The WITC essentially supplements the income of very low-income workers and is fully phased out at very low levels of income. While not specified in the signed agreement, federal officials have suggested that the WITC changes included in the CPP agreement would result in an increase of $250 million budgeted for the WITC. As of publishing date, no other details of the WITC changes have been released but the changes in the federal WITC program do seem to involve discussions with the provinces so as to take into account provincial programs aimed at low income seniors. (Note to conclusion: As of Thursday, while Manitoba wasn’t an original signatory to the Vancouver agreement, it appears it has signed on. While the newly elected Manitoba government released a list of changes it wanted made to the agreement, the list doesn’t appear to have been a deal breaker for Manitoba. That leaves only Quebec as non-signatory and the conclusion provided below makes no attempt to speculate on what changes the Quebec Government might eventually make to the Quebec Pension Plan). The primary intention of this first post was simply to detail the specifics of the Vancouver CPP enhancement agreement and complement that relatively straightforward description with a comparison to the benefits that were about to be rolled out under Ontario’s ORPP – an Ontario only pension plan that was killed off by the Ontario government within days of Ontario’s acceptance of the CPP enhancement terms of the Vancouver accord. As such, only a very cursory assessment of the winners and losers from the accord will be offered here – further elaboration will be done in a second post. First, Canadian workers outside Ontario and Quebec, without a defined benefit pension plan, were clear winners from the accord. In itself, this represents a significant achievement as over 65% of workers in these provinces are without a defined benefit plan. Second, at least some workers (although almost certainly a minority ) with a defined-benefit plan outside Quebec, will see some benefit. Although in the past, CPP benefit increases have been accompanied by offsetting reductions in contributions (and benefits) to most workplace defined-benefit plans, it remains to be seen exactly how employers and unions will react to the 1% contribution hike and the slight increase in the CPP YMPE announced in Vancouver. In any case, the 9-year phase-in of the agreed upon CPP changes gives both unions and employers (and the provincial governments that play a big role in funding provincial public sector pension plans), plenty of time to re-negotiate the terms of any compensating reductions – if they so choose. Finally, the roughly 4.2 million Ontario workers (or 55% of Ontario’s workforce) without workplace plans that would have qualified for the provincial ORPP, were clear losers in the process. As detailed above, these workers would have gotten close to double the increase in retirement benefits under the ORPP than they will now be getting under the revised CPP. A final note: Any detailing of changes in pension plan design is unavoidably dry and readers that have made it this far deserve a prize for their perseverance! But while reading through a description of pension design changes can be painful stuff, the politics of pension reform (and retirement savings policy, more generally) is anything but. Behind the scenes, Canada’s major political parties are all jockeying for position while the country’s power centres battle each other for control over hundreds of billions of dollars in retirement savings – and the management fees that go with that control. In a second post, I take a behind-the-scenes look at the 7 years of power politics leading up to the Vancouver CPP accord in which employer groups, banks, insurance companies, mutual funds, labour groups, and multi-billion dollar pension funds battled it out for control over Canada’s future retirement savings! I think that CPP needed some changes but that is good for the generation coming up as a senior with hydro rates sky rocking , because we even tried doing on off times a little off topic as a Senior I am happy for progress for younger generation but don’t forget those aging . also why when one is on a Long Tem Disability Policy from a LTD we have to apply for out CPP so we are not penalized at retirement when LTD would stop now this is great from the insur. Co but CPP ? Lets get real we get a lousy 1% per year raise, how much is this deal going to give us?